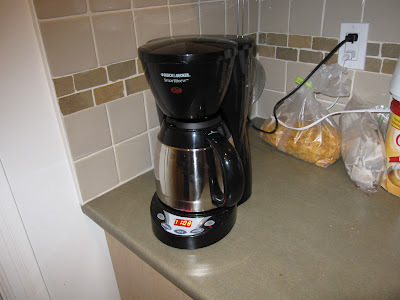 Went shopping for a new coffee maker and ended up in Superstore here in Abbotsford after Wal-Mart didn't have nice ones. 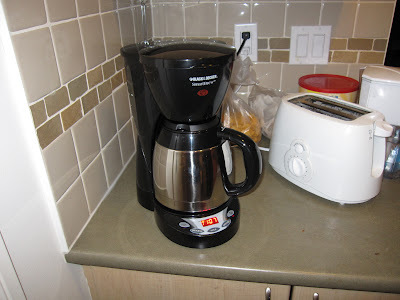 There was one Black & Decker SmartBrew DCM 2590 left on the shelf with a marked down price of $29. Seemed like a fair deal considering it got a thermal carafe and nice design. It turned out that it got decent review, too. Let's see! It should be better than the cheap 15 buck one I bought at Wal-Mart a year ago. A few months ago I accidentally hit the start button and it cracked the carafe. This one doesn't have a hot plate (thermal carafe wouldn't work with it because of the double wall). So this one looks like a good deal.